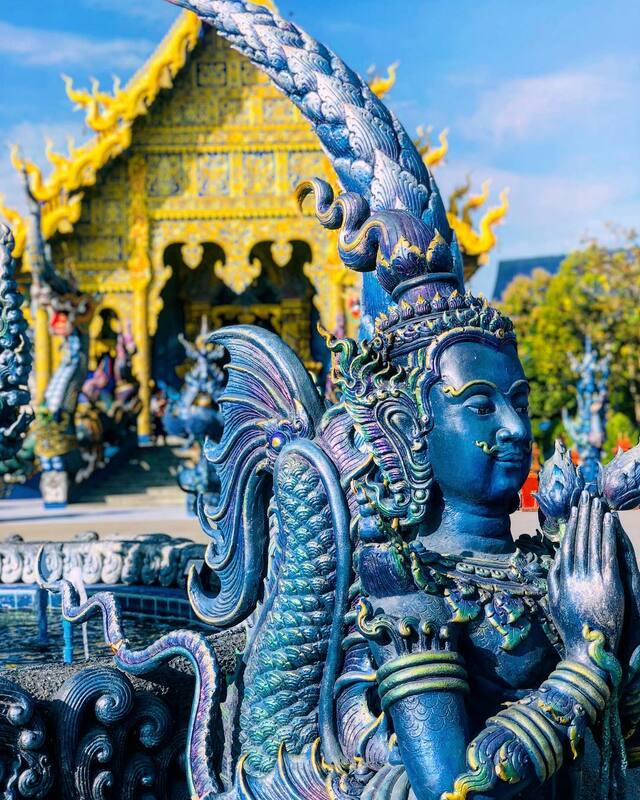 Chiang Rai is a quirky, artistic city in northern Thailand, offering a surprising number of things to see and do. 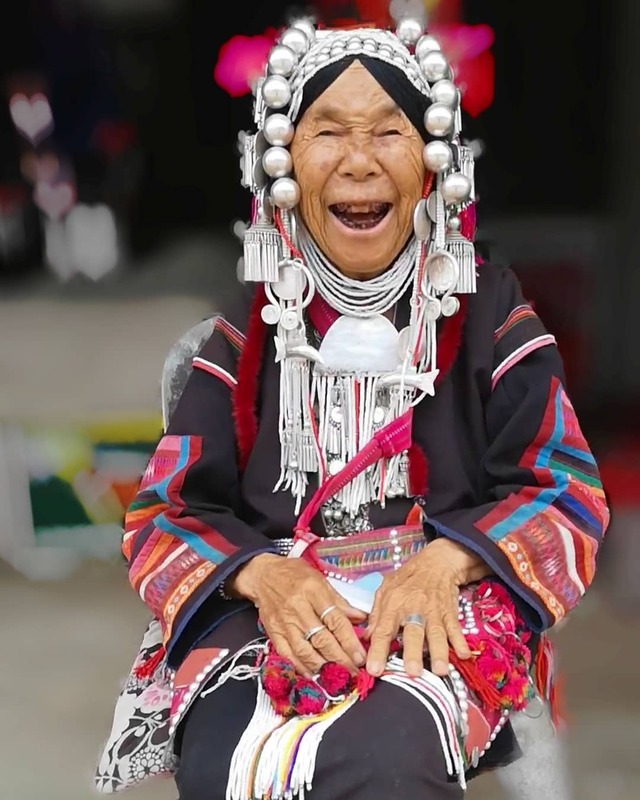 Close to the borders of both Laos and Myanmar, it’s a great base for visiting hill tribes and for scenic mountain trekking. The city is also home to an incredible number of beautiful temples – from historic jewelled monuments to unusual contemporary artworks. 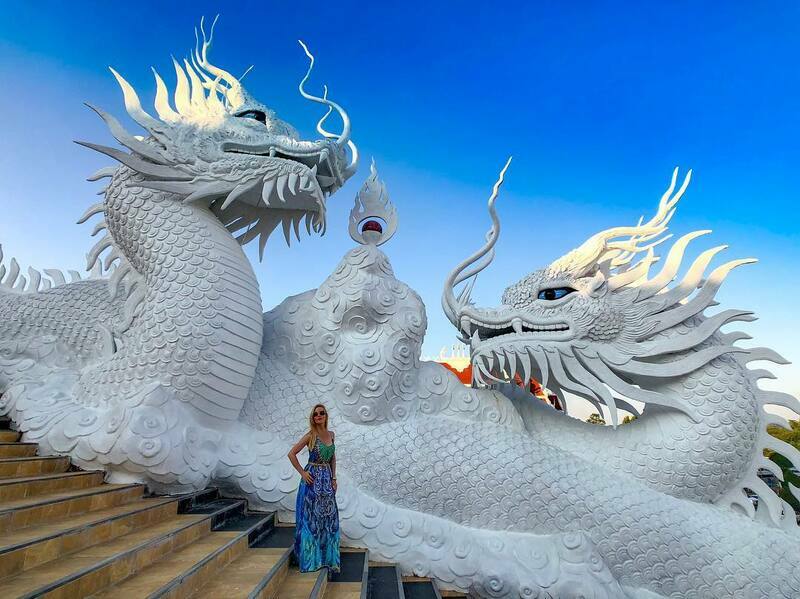 Wat Rong Khun , perhaps better known to foreigners as the White Temple, is a contemporary, unconventional, privately-owned art exhibit in the style of a Buddhist temple in Chiang Rai Province, Thailand. 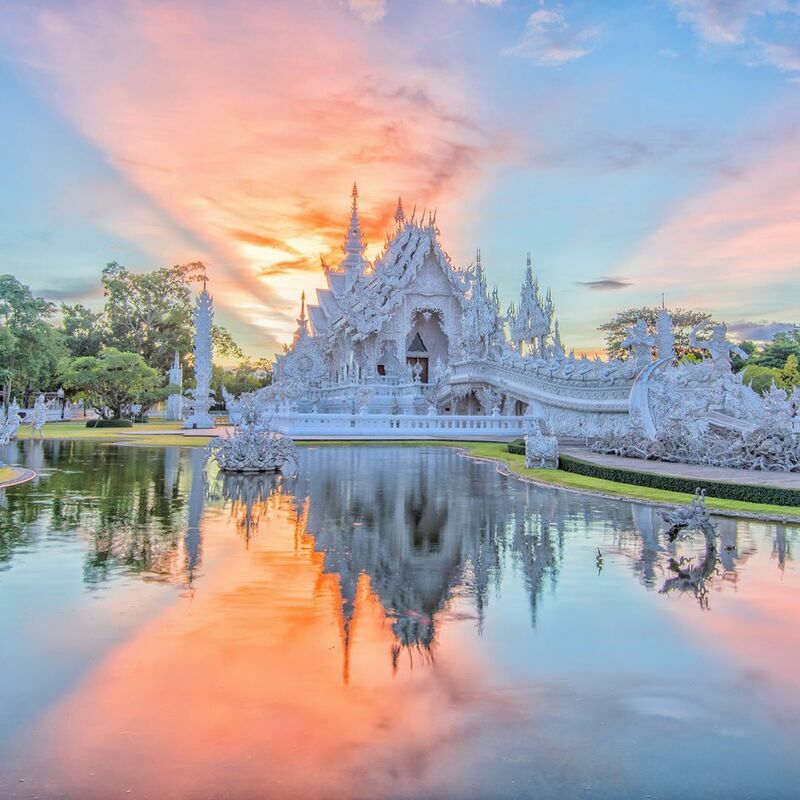 It is owned by Chalermchai Kositpipat, who designed, constructed, and opened it to visitors in 1997. 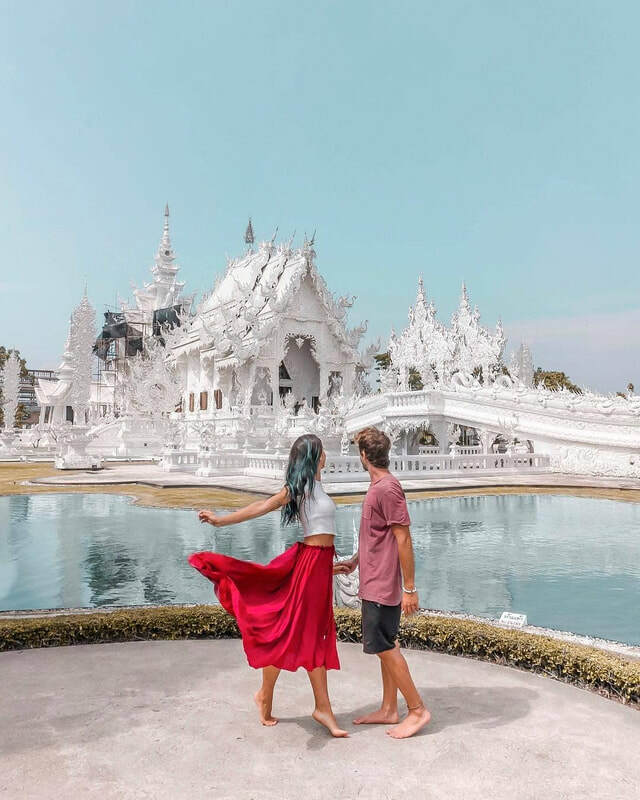 The white temple compound have nine buildings, including the existing ubosot, a hall of relics, a meditation hall, an art gallery, and living quarters for monks. The bridge of "the cycle of rebirth": the main building at the white temple, the ubosot, is reached by crossing a bridge over a small lake. In front of the bridge are hundreds of outreaching hands that symbolize unrestrained desire. 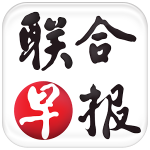 The bridge proclaims that the way to happiness is by foregoing temptation, greed, and desire. Next to the lake stand two very elegant Kinnaree, half-human, half-bird creatures from Buddhist mythology. Gate of Heaven: After crossing the bridge, the visitor arrives at the "gate of heaven", guarded by two creatures representing Death and Rahu, who decides the fate of the dead. In front of the ubosot are several meditative Buddha images. Ubosot: The principal building, the ubosot is an all-white building with fragments of mirrored glass embedded in the building's exterior. 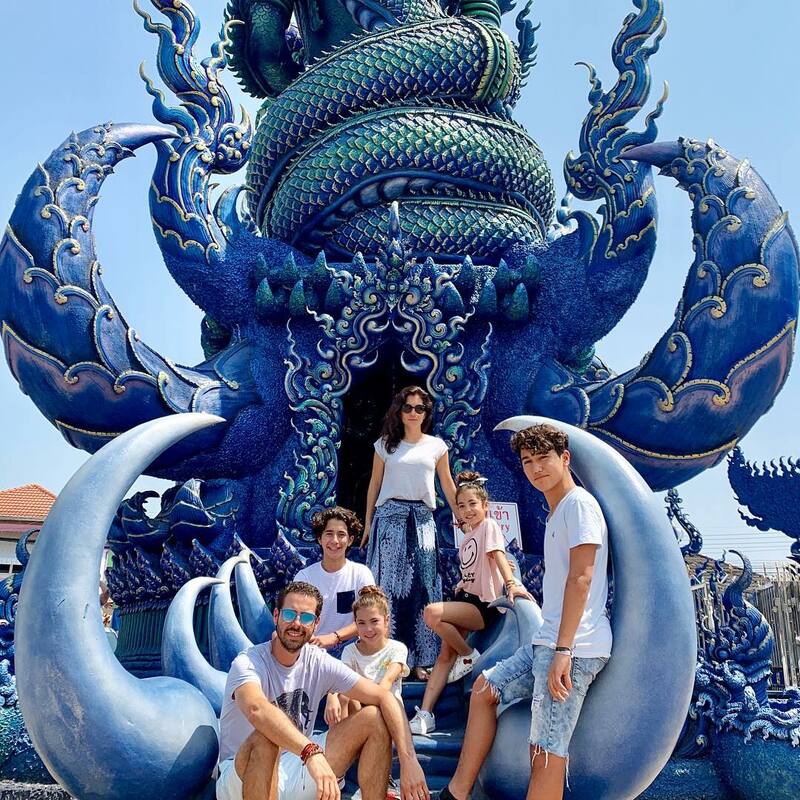 The ubosot embodies design elements from classic Thai architecture such as the three-tiered roof and abundant use of Naga serpents.Inside the temple, the decor swiftly moves from pristine white to fiery and bewildering. The golden building: A structure that stands out because of its color is the rest rooms building. 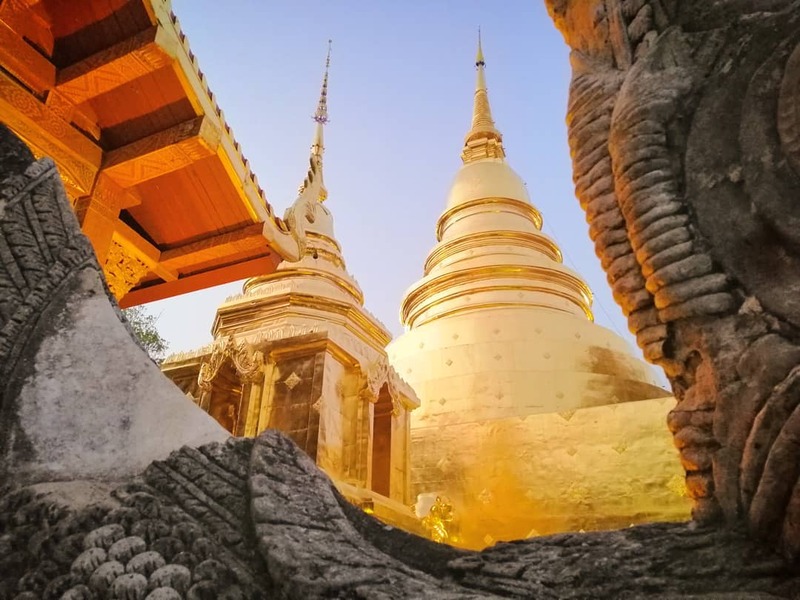 Another very ornately decorated structure, this golden building represents the body, whereas the white ubosot represents the mind. The gold symbolizes how people focus on worldly desires and money. The white building represents the idea to make merit and to focus on the mind, instead of material things and possession. Everything at Baan Dam is black and gives off a dark aura. Each one of the 15 houses is embellished and furnished with animal remains. 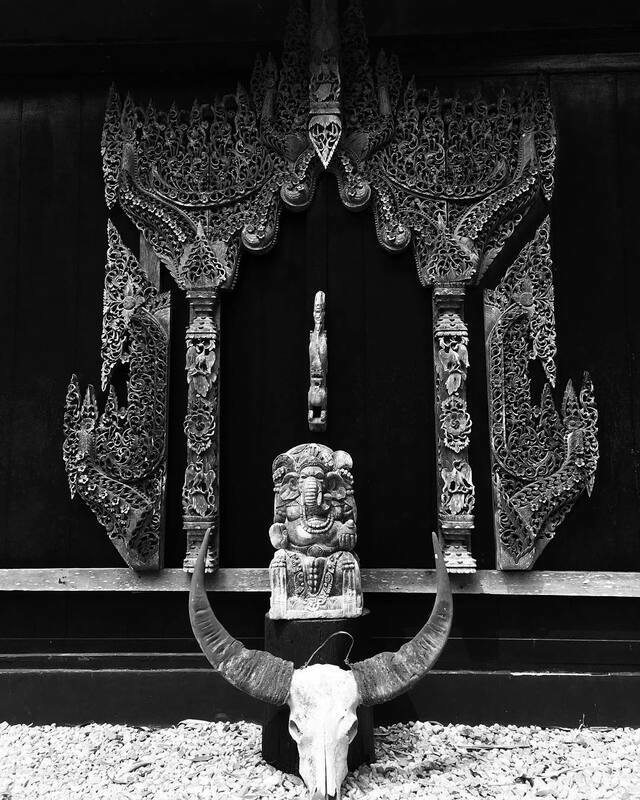 Baan Dam is Thawan Duchanee’s artful portrayal of hell. 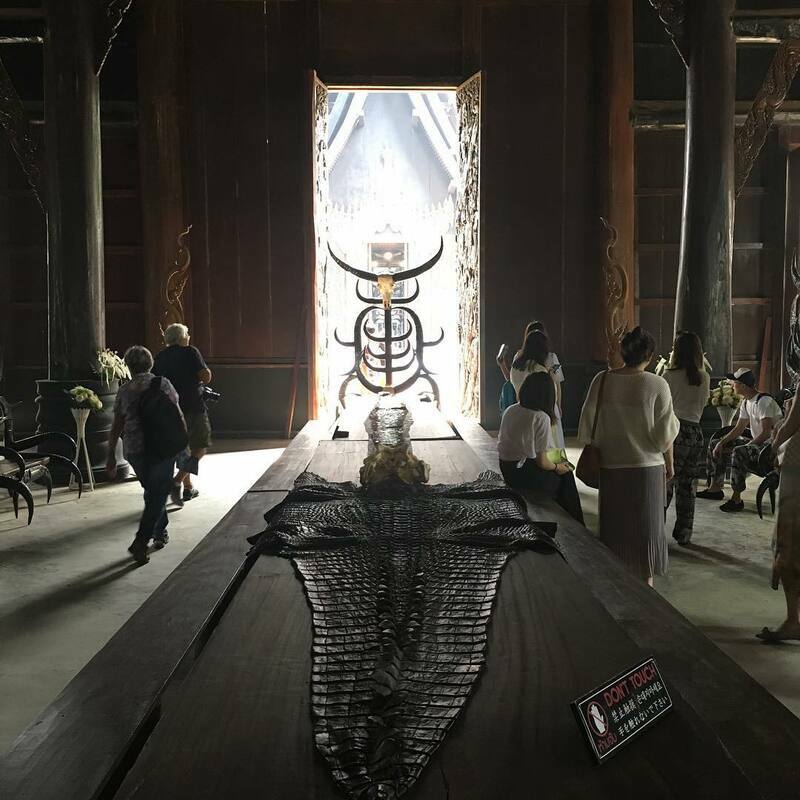 The opaque decor and dead animals adorning each room make Duchanee’s estate the complete opposite of the White Temple, the glimpse of heaven designed by his teacher Chalermchai Kositpipat. The main temple is a large wooden structure. The black tiered roof has curvy metal points jutting from the sides. Inside, the wooden infrastructure is aesthetically exposed. In the center a long wooden table with benches on both sides is lined with an incredibly long snakeskin runner. One hut, designed like a Budhist stupa, contains a circular room, lined with chairs made of buffalo horns and skin. The centerpiece is a giant crocodile skin, painted black and surrounded by candles. The room is known to reverberate and amplify sound. 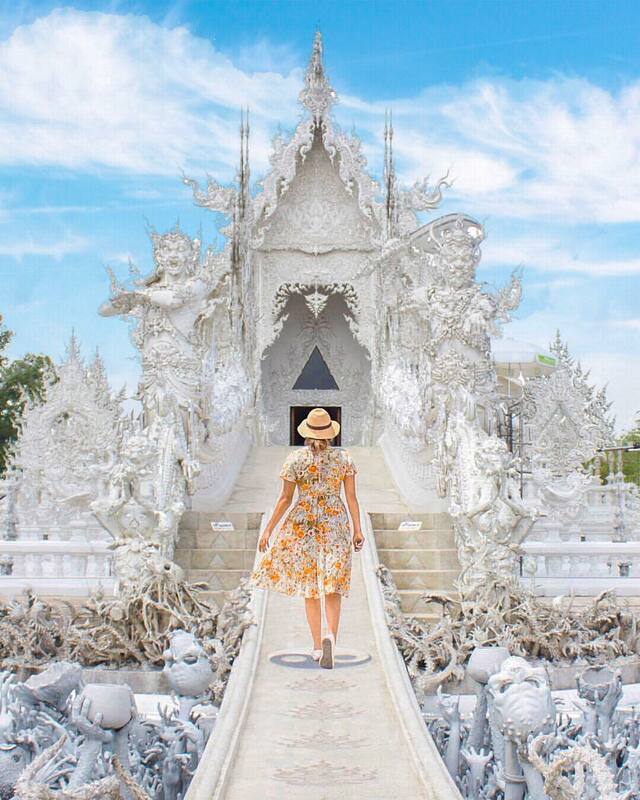 ​​Wat Rong Suea Ten is a six-acre property located in Rim Kok, a subdistrict of Chiang Rai. 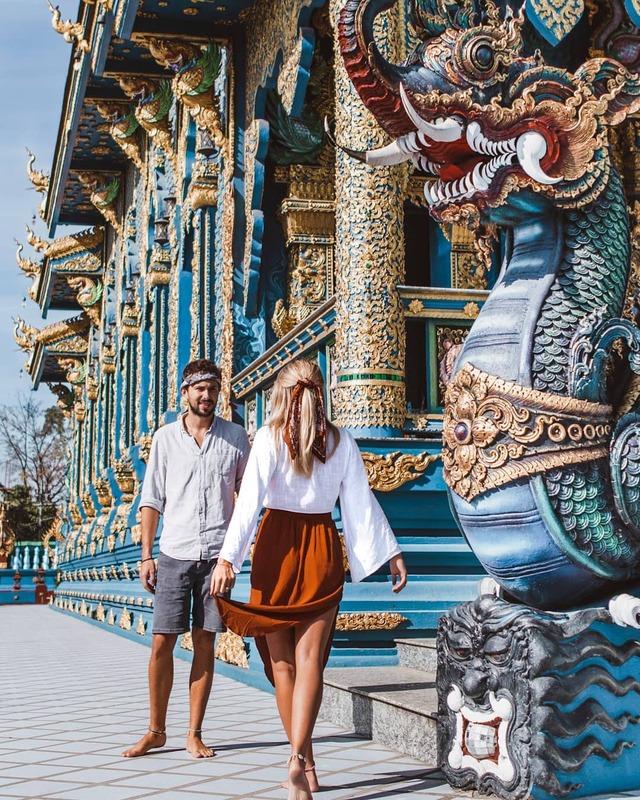 More commonly referred to as the Blue Temple, its monastery and pagoda were built upon the ruins of an ancient temple, abandoned 80 to 100 years prior. The monastery was designed by Phuttha Kabkaew, a protégé of Chalermchai Kositpipat, and derives its name from the inhabitants of Rong Suea Ten village. The region was once a natural habitat that teemed with wildlife, including tigers which “danced” (leapt) over the nearby Mae Kok River. The name translates as House of the Dancing Tiger: rong is the Thai word for house, suea for tiger and ten for dancing. A pair of fierce and wildly colorful naga flank the balustrade, acting as guards to the monastic hall’s entrance. Both the exterior and interior walls are covered in a vivid indigo hue embellished with gold. 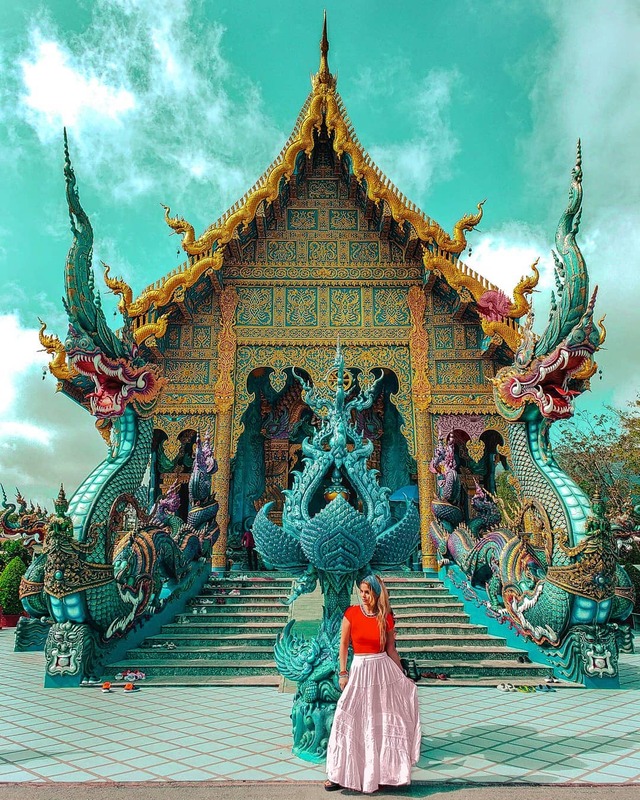 Unlike at the White Temple, visitors are allowed to take photographs of the viharn’s interior. 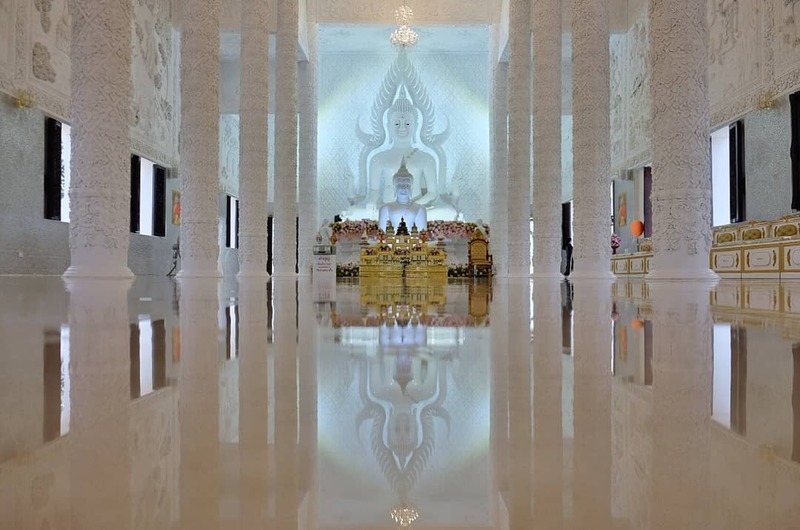 Inside, at the end of the great hall, a colossal white Buddha statue in the Bhumisparsha Mudra position sits framed by towering filigreed columns. His legs are crossed and his right hand points to the ground, the gesture of touching the earth, representing the moment Buddha attained enlightenment. Turn back to look at the entrance, and you’ll see a representation of Hell, with the doors you came through actually a demon’s mouth. 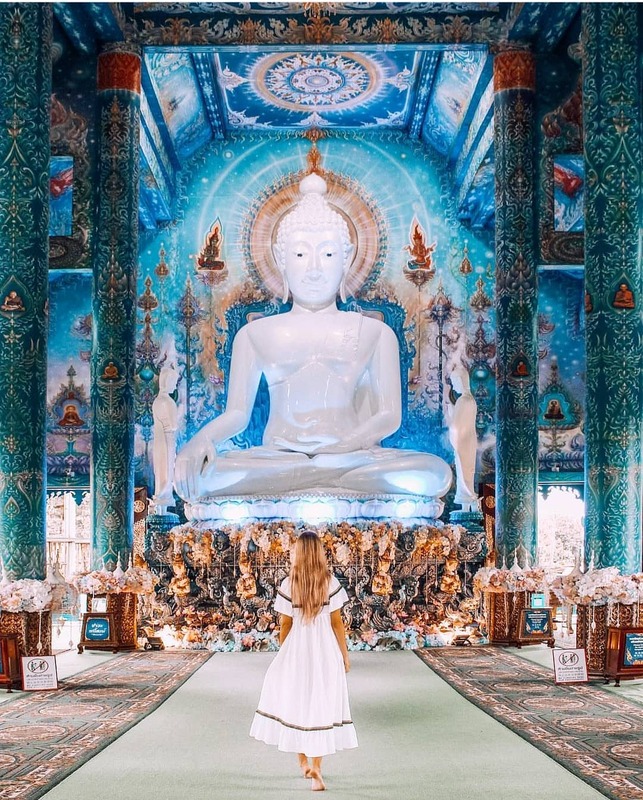 To symbolize dharma, the Buddha’s code of morals, the temple is predominantly painted blue, which is associated with wisdom, the infinite, purity and healing. Blue is also the least “material” of all hues and speaks to the limitless heights of ascension. The Virgin Mary and Christ are often shown wearing blue, as is the Hindu deity Vishnu and his blue-skinned incarnation, Krishna. 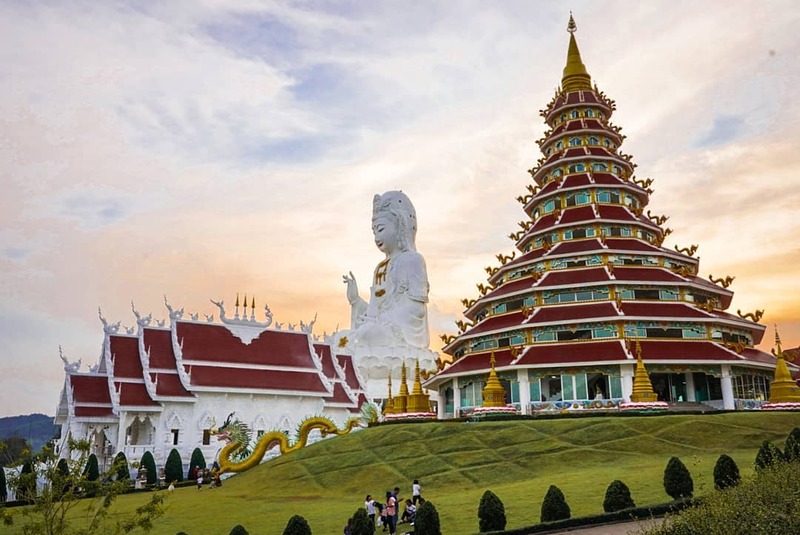 The temple ground is home to a 9-storey pagoda (hence its name) as well as the largest Guan Yin Bodhisattva in Thailand (23-storey). 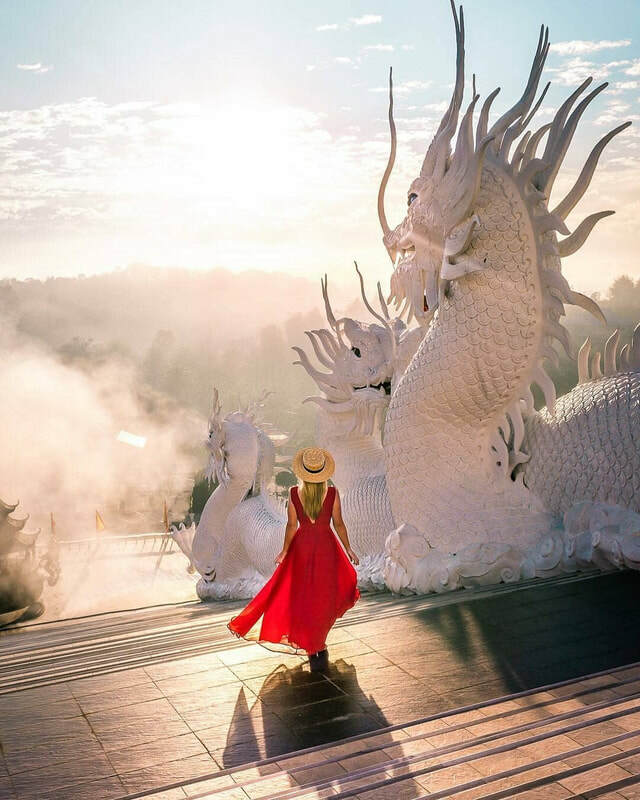 It is famous for its unique blend of Thai-Chinese architecture with an exquisite dragon staircase leading to the pagoda. 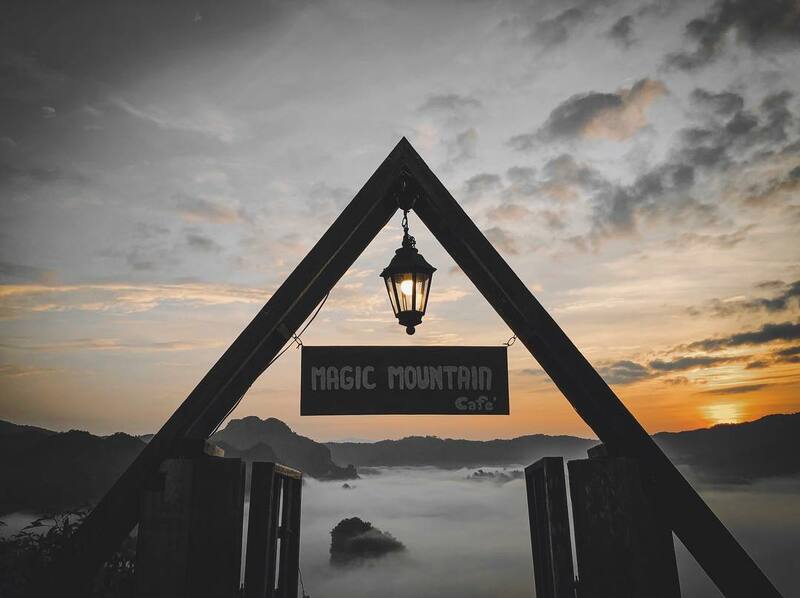 There’s a hidden gem in Northern Thailand, right on the border of Laos, that’s home to one of the most beautiful sunrises you’ll ever see. It’s called Phu Chi Fah and although it’s well-known among Thais visiting Chiang Rai, it’s still considered an undiscovered place for most international travellers. 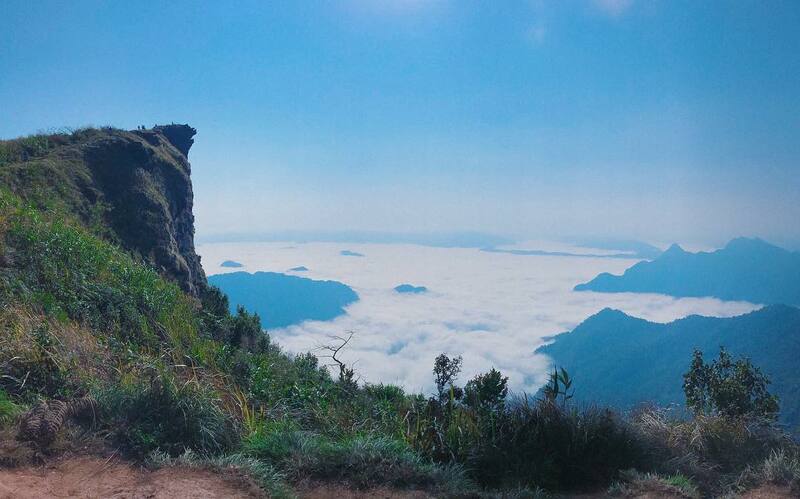 We will arrive in Phu Chi Fah on the 3rd day at 5am and hike up to the viewpoint for the sunrise. 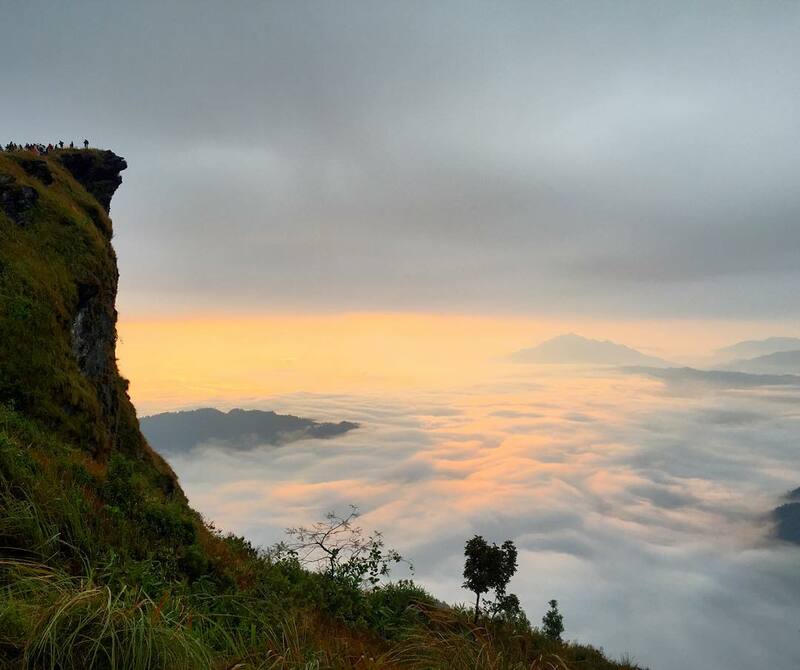 Phu Langka, is a protected area of the Phi Pan Nam Range located in Chiang Kham District and Pong District, Phayao Province, Thailand. The main attractions of the forest park are the "sea of fog" in the valleys in the early morning and the mountains of Doi Hua Ling, Doi Phu Lang Ka and Doi Phu Nom; the latter is a breast-shaped hill rising in an area of grassland. If you have seen Ha Long Bay in Vietnam, you'd recognise the the towering limestone island topped with a thick forest rising from the water. 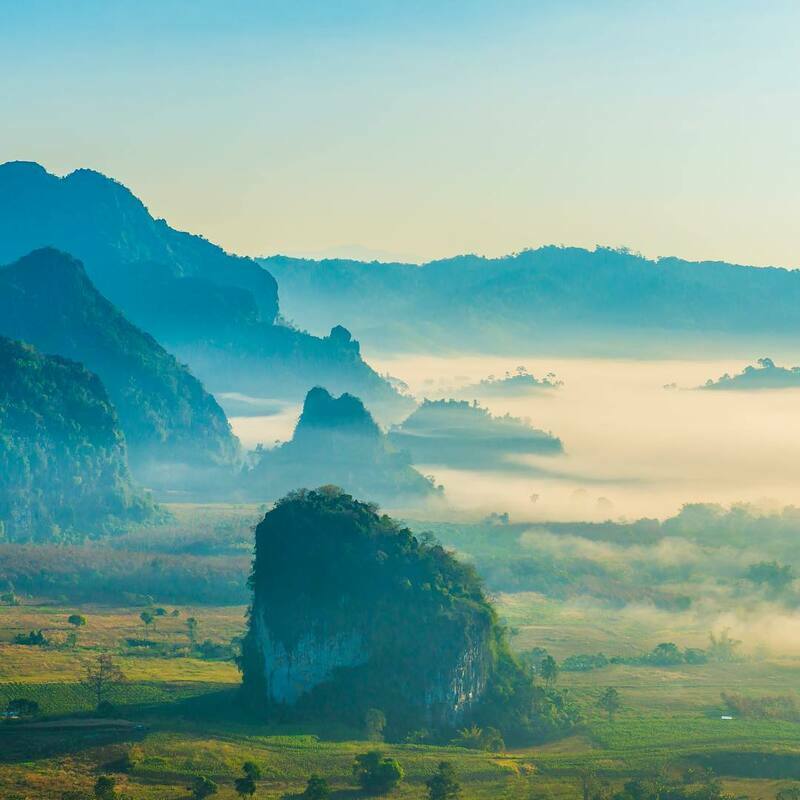 Below are some of the images of Phu Lang Ka, instead of water, you'll see the sea of fog creeping and rolling on the ground with limestone mountain tops peaking through. It is still a less known travel destination and is equally beautiful during both sunrise and sunset. 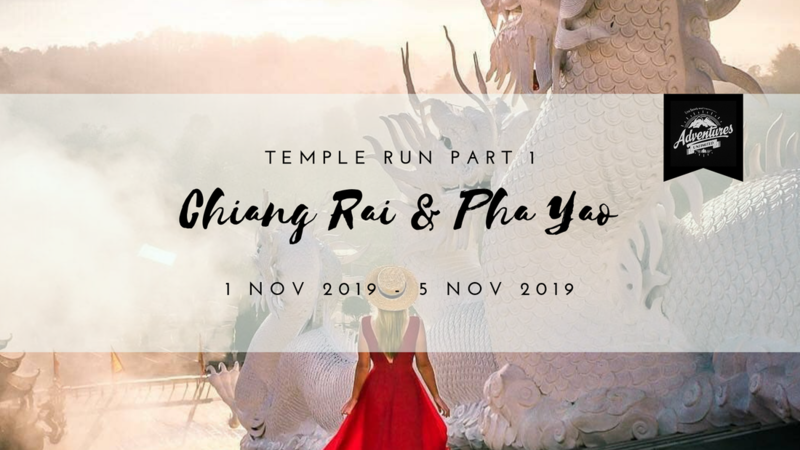 If you are looking for an itinerary that incorporate the cultural, adventure and photography aspect, the ‘Temple Run Part 1: Chiang Rai & Pha Yao 2019’ gives you the best of not just both but three worlds. 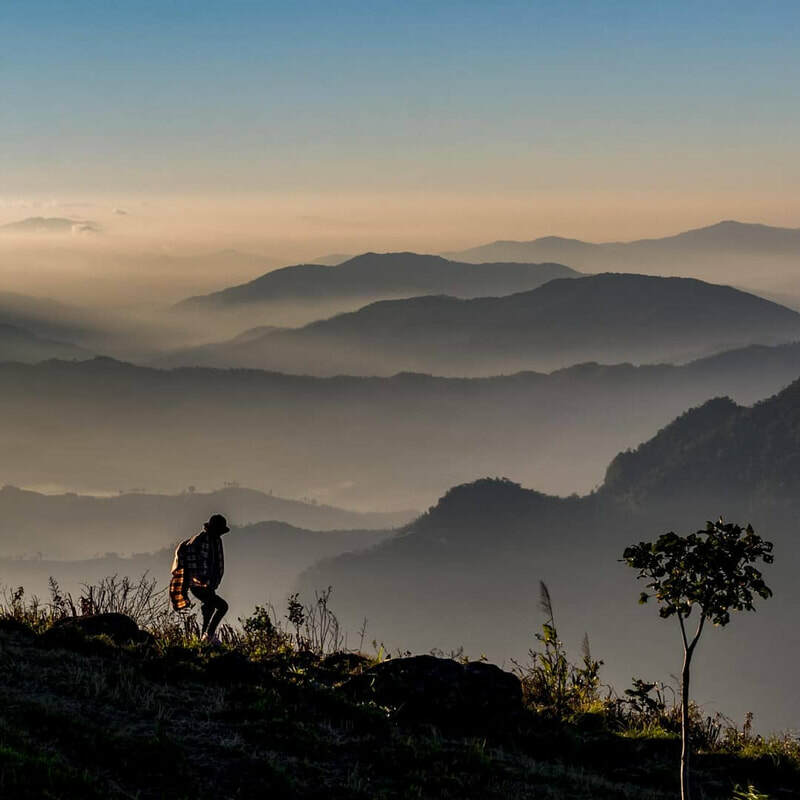 We have customised the package in a way that you will get to experience the ruggedness of the trek and also get your fair share of ‘Instagram superstar moments’ while you visit the local temples. 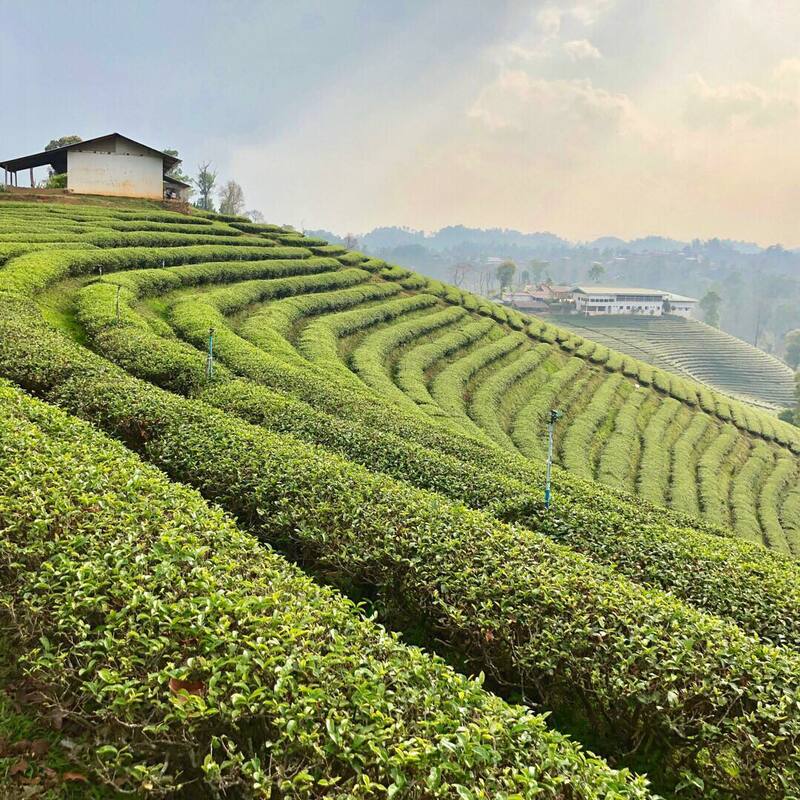 Here are some sights that you will come across during the trip. The event host will endeavour as far as possible to adhere to the programme of the event as advertised. The event host however, reserve the right to alter routes, time-tables, itineraries and accommodation as they deem fit. Still not convinced? 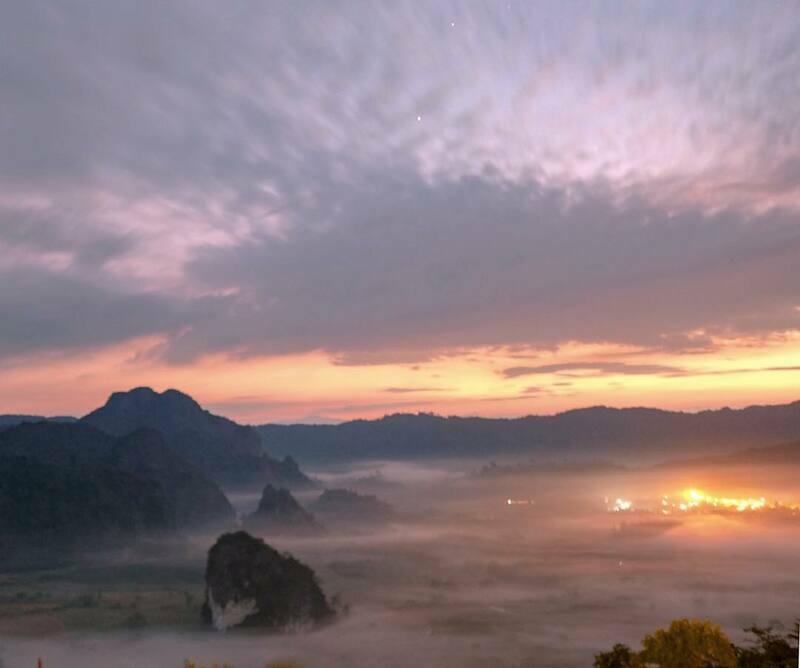 This time lapse video of Phu Langka may change your mind. SGD 500 deposit will be collected to confirm your slot. Balance to be made latest by 1 August 2019. Step 1: Deposit of SGD 500 via ATM/Bank transfer to ADVENTURES UNLIMITED, DBS CURRENT A/C - 0039351950. Step 5: Balance payment to be made latest by 1 August 2019.